This is my way of giving back to community...what's yours? and created what I call an "ABC" book and offering it to you for FREE! 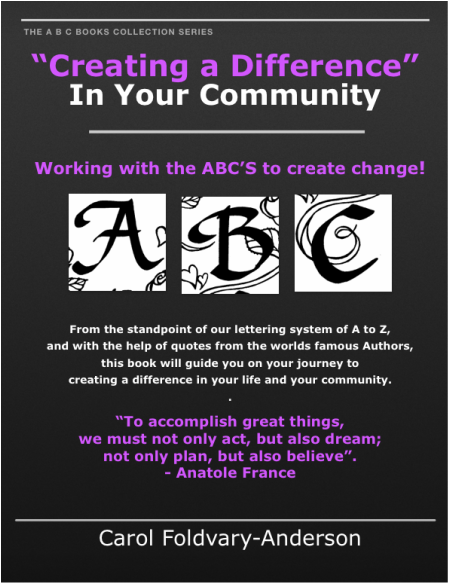 Working with the alphabet, and the ABC's we are able to instill change and "Create a Difference" in Our Communities and Ourselves. This helpful reference to change includes practical ideas, action steps and inspiring quotes from the worlds famous authors. After reading you will have the formula and tools, to create that positive difference. This book is a work of art and easy read, including beautiful Calligraphy lettering from A to Z. Written and produced by multi award winning designer, author, illustrator, lettering artist Carol Foldvary-Anderson.